The 2018 home and away season has come to an end, and footy tipsters all over the country are reflecting on one of the toughest seasons in memory for predicting winning teams with any consistancy. This fact is represented on the final 2018 NRL standings, where the smallest margin in NRL history separates first and eighth place. Most punters were left floundering, with plenty of NRL media experts also failing to make heads or tails of a crazy rugby league season. 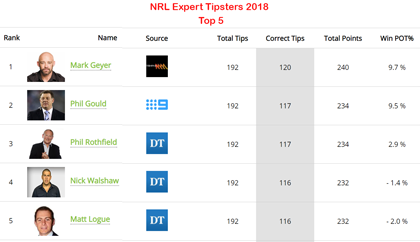 Despite the significant challenge facing NRL analysts in 2018, the cream certainly rose to the top which is there for all to see on the NRL expert tipster leaderboard. We pitted 48 of the game's leading journalists, ex-players and figure heads against each other, tracking their tips over each of the 25 rounds to find out who really is the sharpest mind in the game. 6 of the top 10 tipsters were ex-players, 5 of which were New South Welshmen. 4 of the top 20 tipsters were female, with Yvonne Sampson from Fox Sports leading the charge. Continuing NSW's dominance over QLD this year, 4 of the The Daily Telegraph's journalists finished in the top 10, whilst the best finisher from the Courier Mail was Sam Squires who came in 15th. The entertaining and insightful Johns brothers share more in common than a surname, with both finishing in the top 10 on equal points for the season. Leading NRL journalist Phil "Buzz" Rothfield and Panthers' supremo Phil "Gus" Gould shared the runner-up position. The title of NRL Expert Tipster of the year went to former player, Penrith Panthers legend and current Triple M presenter, Mark Geyer. MG finished on 120 correct tips for the season, three tips clear of Gus and Buzz, and with a tidy 9.7% profit on turnover i.e. if you had placed a $10 bet on every one of MG's tips, you would have made $186 profit. Residing in Sydney's west and ever proud to fly the 'Westie' flag, Geyer hosts the 'Rush Hour with MG,' which takes place on weeknights from 6-7pm on Triple M.
Listeners to the program won't be surprised that Geyer beat all comers. The gentle giant's NRL knowledge, unique perspective on the game and sense of humour continues to make him a fan favourite within the rugby league community. We caught up with MG to pick his brain on the secrets to his tipping success this season and his NRL betting tips for the finals series. Home ground advantage was definitely one of Geyer's main considerations, telling us that he places a "big importance on home grounds, especially those of the suburban type". Furthermore, Geyer holds a strong belief that teams who share grounds, like ANZ Stadium, are disadvantaged. He noted "I often tread carefully when tipping teams who don't have their own ground". Asked whether he considered extra motivation factors when deciding who to tip, such as a coach being under fire or a player with something to prove, Geyer responded "emotional factors have to be taken into account, but it's not the major contributing factor. Form, or lack there of, plays the biggest part". But what would set Geyer apart from most tipsters is his knowledge of how crucial a team's forward pack are to their success. "I ALWAYS look at the forward packs first when searching for an outcome. Then I look at the team's forwards on the bench. I suppose being an ex 'pig' myself, it's only natural I lean this way". One of the toughest forwards the game has ever seen, Geyer's tendency to favour the forwards stood him in good stead, given teams with huge packs like the Rabbitohs, Roosters and Storm all fared well this season. On the flip side, tipsters who were seduced by the talent-laden back lines of the Parramatta, Manly and the Cowboys were found out this year. However, there wasn't always a scientific reason behind the ex-Panther's tips, who stated that while he mostly goes with his head over his heart, "I never tip against the Panthers". Considering how many games Penrith got out of jail with comeback wins this season, Geyer certainly rode his luck in 2018. "Luck plays a MAJOR part in tipping a winner in the NRL. It's why I never bet on a winner of a game, just the exotics such as first try scorer". MG was modest in dismissing his success to luck. However, there is no question that his rugby league knowledge, insight and perspective as a former forward helped him to the summit ahead of all other experts working in the NRL media. Finishing top of the toughest tipster leaderboards in the country. On his predictions for the finals and Dally M medal, Geyer stated "I think the Storm will somehow find a way to win the comp, and I think Roger Tuivasa-Sheck will win the Dally M with Tevita Pangai Jnr as a smokie". Based on his tipping performance this season, you'd be brave to bet against him.